05-Jul-2003 -- This confluence is near the town of Ewell. It is the northernmost habitation on Smith Island, the only populated island accessible only by boat. The community has been sheltered since the 17th century, and the Elizabethan Era accent is still heard in the speech of the people. They are a friendly and hospitable sort, and my opinion is that they have a bit of wild side to them that is unseen to foreigners. We took the Smith Island Tours boat from Point Lookout to the island early on July 4th. Our bags were packed to spend the night. Captain Alan Tyler was our pilot, and Marty was our guide. They took us directly to the island and recommended we eat at the Bay Side Inn (the food is of a light fare and very delicious). As you enter the bay of this island, you can see the signs discouraging support of the Chesapeake Bay Foundation which, although trying to save the wildlife, is leading the lives of these watermen to extinction. We stayed at the Ewell Tide Inn owned by Captain Steve Eades, a remarkable fellow who owns the Smith Island Marina and the Driftwood store. He offers 24-hours services and receives infrequent calls for midnight rides on the Chesapeake Bay. Also notable is his pier that was the haunt of Ernest Hemingway many years ago. Island transporation is mostly bicycles and golf carts. The inhabitants are 350 watermen, some stray cats, and a small pack of tame dogs. Ducks and their offspring waddle around the small streets, and at night you must be careful not to step upon tiny crabs skittering across the roadways with their one giant claw furiously held up against you in defense. It was July 4th, so Jake Miller was holding his yearly gala down at Rhode's Point. We biked down there to see the pie-eating contest and water balloons, but we returned home much too early to view his awesome firework display. Early the next morning we grabbed a two-man kayak and set across The Big Thorofare. It was quite a feat for two amateur paddlers to get into the water, but my nautical chart told me that waters were only 2 to 3 feet deep most of the way. I brought plenty of drinkig water and a beer. We saw ospreys, pelicans, and plenty of seagulls along the way as we entered Martin Wildlife Reservation. The creeks and bogs were a major hindrance to us, but we finally reached our destination. I recommend this confluence to all adventurers who really want to get a workout and a view of a slice of life rarely seen by most commonfolk like me. I enjoyed this confluence more than any other I have visited because of the people I met along the way. It is truly a unique place. #7: This is the best place in the world to catch crabs! 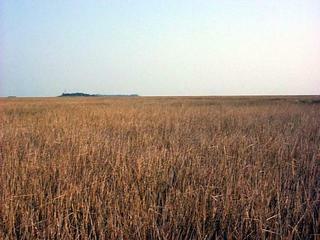 Located on marshy Cherry Island in Chesapeake Bay.